Hover Cover is a microwave splatter cover shield that sits over your bowls or plates and provides protection. Rather than affixing directly to the plate or bowl like others on the market, this unit sits on top, hovering over the entire food without touching it. 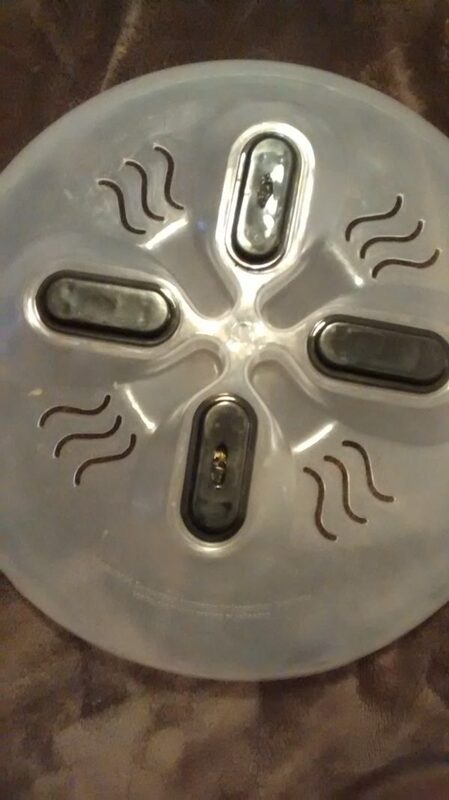 The steam vents prevent soggy food. When you are done using the unit you can just use the magnets on top to easily store it right inside the microwave until next time. The cost of Hover Cover is $14.99 plus $4.99 shipping. The special TV offer allows you to receive a second Hover Cover by paying an extra fee of $4.99 for a total price of $24.97. The Hover Cover is a great way to keep your microwave clean. When you prepare foods that splatter or spill over, few people wash them out immediately, especially if the microwave is difficult to reach. This means that the more food is prepared, the more burnt that splatter becomes. With the special splatter guard, any food splatter ends up on the inside of the Hover Cover and no the microwave. When you are not using it, you can leave it in the microwave. Thankfully though, you do not have to take it out each time you want to reheat something, then place it over your food. Instead, microwave-safe plastic magnets hold it up against the top of the microwave in waiting while not in use. Then you can just pull it down. The bubble shape is big enough to cover most platters, bowls, and dinner plates so you do not have to worry about fitting all of your food onto a small bowl. It is also large enough to fit into almost any standard microwave. When you use the Hover Cover you can reheat leftovers without spills, naturally covering your food. You can do so without the risk of rags that fall onto the plate and contaminate it, or bowls or plates that leave the food soggy. Opposite the magnets on the top of the unit, you will find steam vents. These are specially designed to reheat food but still allow steam out so that food remains fresh. With other covers like lids, bowls, or plates, you do not have this option. The unit is made of a non-stick microwave safe plastic, so any splatter that it catches can be wiped right off. If it does get too dirty though, you can throw it in the dishwasher for an easy clean. The vent cannot be closed. This means that you have no choice but the vent out steam, even in cases where you might not want to, such as when reheating rice. It also means that you cannot leave the Hover Cover as a lid or shield over your food while you wait, then remove it when you are ready to eat. This unit is made of plastic, so be warned that some plastic taste might leak into food if you are reheating for a long period of time. 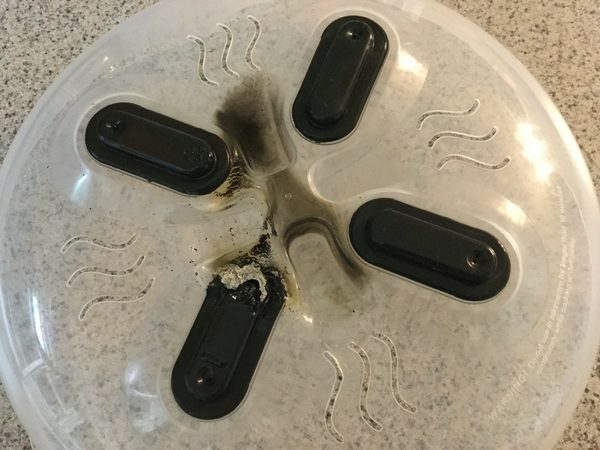 Exercise caution when removing the lid after reheating something, especially if you were doing so for a long period of time. Just like any other microwave-safe plastic, it might be somewhat hot to the touch. You can easily place it on the top of the microwave, but even for a few seconds, it can burn. There are alternative splatter guards which do the same thing, but they are all about the same size. They span the circumference of a traditional dinner plate but only stack about two inches in height, not allowing for bigger bowls or anything. Hover Cover is different insofar as it is taller, so it can be used on more than just plates. What’s more, the other covers are made from silicone in some cases, not plastic so they are flexible, while this unit will retain its shape and not touch the food it is covering. Other models lack the same steam vents that Hover Cover has. Finally, the other models lack the magnet strips at the top that make for safe and easy storage. Pull down the Hover Cover from the top of the microwave. You will find four finger divots inside of the top which is designed to give you a better grip for lifting. When you are done, place it up against the stop. Be warned that the finger divots are located on the top, so you will not be able to use them when you place it on the top of the microwave for storage. The Nordic Wave Splatter Cover is a microwavable splatter cover that fits standard dinner plates. If left on top of the plate it will keep food hot until you are ready to serve. This means you can reheat your food, leave the cover on, and then remove the cover when you are ready. You can place it in the dishwasher when done. TopBPAFree makes a vented microwave food cover that fits standard dinner plates. It can be cleaned with wiping or in the dishwasher. This design, however, has a similar dome shape as Hover Cover and the vented steam release function. As such, it sits high enough in the microwave not to touch your food. Handling it is easy with the rim handle for easy lifting in and out. The vent lets out steam but can be closed when you want to keep food warm. So, much like the other options on the market, this cover can be kept on your plate with the vent shut until you are ready to eat. This option is BPA free and has recipes for it. Beyond the plate covers, there are bowl covers designed in the same fashion. These give you the option of a separate unit which can cover bowls while you reheat things like soups and stews. Some options have the vents but most do not and instead fit standard dinner bowls with a beehive shape. Most of these are made out of plastic but some are designed with food grade silicone. There are units to fit small bowls or big bowls, but not often both. They affix directly to the bowl. Take advantage of the magnets. It is a great way to store the unit out of sight, without adding to the requirements of your cupboards or cabinets. Play around with the time settings for reheating your food. Using this cover might influence the amount of time needed to heat up food. Microwave covers work! Wither you spend a lot of money or a little; generally, there won't be much difference in quality or utility. In Jan 2017 the Tovolo Collapsible Microwave Cover was the *Best Seller on Amazon* in Microwave Oven Parts & Accessories. This is one of the rare covers that does offer a unique feature in that it collapses for easy storage when not in use. There is no real difference provided in using a glass cover as opposed to a plastic cover; however, some people prefer glass as it has a more class / less cheap appearance. The Catamount Glass Microwave Plate Cover has received excellent reviews and at times has been sold out. If you are interested in the glass version while the stock is available, we recommend not waiting. There is nothing on the market that has the function of sticking to the top of the microwave quite like Hover Cover. Hover Cover is a microwave-safe, BPA-free splatter guard that lets you cook, steam or reheat foods without making a mess. 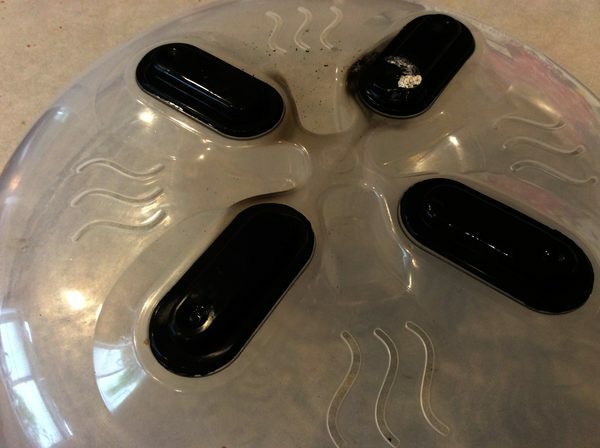 The Hover Cover has several polymer-encased magnets that allow you to neatly store the splatter guard on the ceiling of your microwave oven. This splatter guard has built-in steam vents so you can quickly steam vegetables in the microwave. The cover is even designed to stay cool to the touch. It is dishwasher safe and easily rinses clean with its non-stick surface. Also doubles to keep your food warm after you've cooked it. You can cover it with the splatter guard to keep your food warm until you're ready to eat. In today's world, it can be difficult to know what products are safe. Hover Cover was designed with safety and the environment in mind. It is food safe and free of BPAs so you don't have to worry about what harsh chemicals might be getting into your food. The Hover Cover has specially designed magnets that allow you to secure the cover to the inside of your microwave when not in use. Just pull it down to cover food or lift it up and let it hover. Hover Cover is designed to fit over most plates, bowls and even some smaller platters. It also fits in almost any microwave. Hover Cover has integrated vents that allow steam to escape. The cover is also designed to stay cool to the touch even right after heating. Cleaning the inside of your microwave can be a lot of work. In time, foods get burnt onto the sides and it can be hard to get into all of the tight spaces. Hover Cover allows you to save time by keeping the inside of your microwave clean. The guard is easily wiped clean and can even be thrown into the dishwasher for an easier way to clean it. Although the Hover Cover is mainly designed as a splatter guard, with its built-in steam vents, you will also be able to steam veggies. An easy way to add a little bit of nutrition to your meals. Cleaning products can be expensive. You will no longer need to spend as much money on cleaning products since you will no longer need to scrub the inside of your microwave. Hover Cover easily wipes clean and doesn't require any special cleaners. Always be careful when cooking hot food. Steam can get very hot and could possibly cause burns. Never let children use the Hover Cover without adult supervision. May not fit all microwaves. Some people have complained that they were unable to secure the Hover Cover to the top of their microwave. Partially due to an uneven surface and partially due to weak magnets. There have also been complaints that it took a long time to arrive and some have said that they received their product broken. Do not buy Hover Cover online before searching Amazon. Got this item as a "white elephant" Christmas gift and thought it was a great invention. Four weeks later I stand corrected! I've had no problems with this Hover Cover until last night. The whole thing caught fire in the microwave. The scariest part is that I was in the other room waiting to hear the beep that the microwave was done heating so I had no idea it was on fire inside until smoke started to fill the house! There was no other reason but these magnets in this thing. When I could finally pull the glass tray out the Hover Cover was unrecognizable and the magnets lay on the glass still burning! Ours is an over the stove whole unit too so this could have burnt the whole kitchen down. It's gonna end up setting someone's house on fire. This product is literally putting live's at risk. This product has to be taken off the market immediately! Mine just caught fire too! 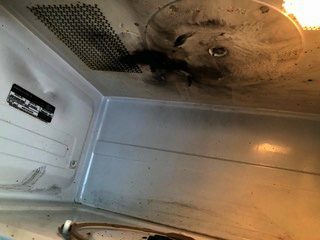 Ruined microwave and could have ruined brand nee kitchen. I paid for my microwave around $160 and my microwave started making a loud noise then stop working, I'm just glad that didn't catch on fire like a lot of others customers. If any body knows where to put a complain please and thank you. Yesterday My Husband baked two Potatoes in our Microwave, the Hover Cover ruined our Microwave! Our microwave is about fifteen months old. We paid about $19.00 at Bed Bath and Beyond for the Hover Cover 3 months ago and it ended up costing us around $400.00 for a new Microwave. Purchased my Hover Cover from Bed Bath & Beyond three weeks ago and regret it! It sparked after 3 minutes and started a fire in side my built in microwave. How does one file a claim against this company? This could have burned down my home. So far, I'm out over $400. Same thing happened to me, one of the magnets got fried and started sparking. What's one to do, trying to email company. Not worth the 14.99 I paid for it. One of the plastic covers on my Hover Cover melted and damaged the top of my microwave. The smell was horrible. Thank goodness we caught it in time before it started a fire. Please don't buy this product! Covers the plate better than some smaller ones but will not stick on top. We had this for about a month. Today it caught fire in the microwave and the plastic around the magnets melted. I didn't adhere t the top of the microwave very well - but who cares when it catches fire. What a dangerous item. My Microwave started popping and sparking 2 days ago after only having food in the microwave for 92 secs. I noticed there was a flame on top of the Hover. Microwave is now ruined. 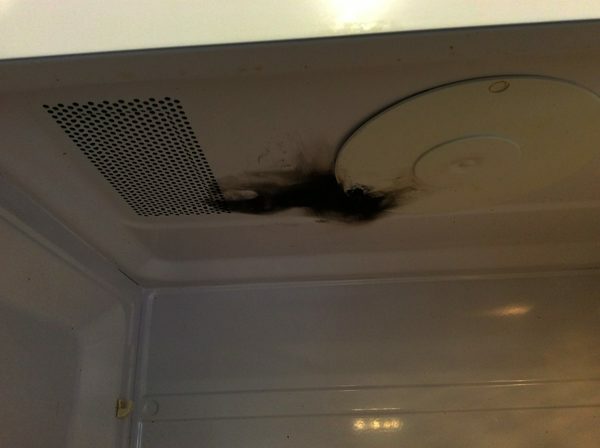 How many ruined microwaves and fires does it take to get a recall and class action suit against these defective Hovers? These are very dangerous! Buyer Beware! Hover Cover KILLED MY BUILT IN MICROWAVE OVEN! I bought my Hover Cover at Bed Bath & Beyond, because in concept, it was a great idea! And I assumed it had been fully tested so that consumers could safely use it. WRONG! This product, after only 4 or 5 uses, caused arcing and destroyed my microwave. Filled the kitchen with smoke by the time I heard the awful noise coming from it! The worst $15 Ive ever spent, especially given that I will now have to replace a built in microwave oven that may cost me upwards of $500! Shame on the manufacturers. Do not buy. It started a fire in my microwave almost burned my house down. Need to sue them. Hover Cover black magnet cover caught on fire. Should be recalled! Starts sparking in my microwave after 1 minute. Waste of money. Sure wish I would have read reviews before buying this. 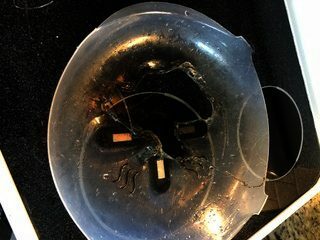 Magnets caught fire and ruined the microwave. We had to use an extinguisher to put fire out and then spend a lot of time cleaning up. Is there no class action suit coming? 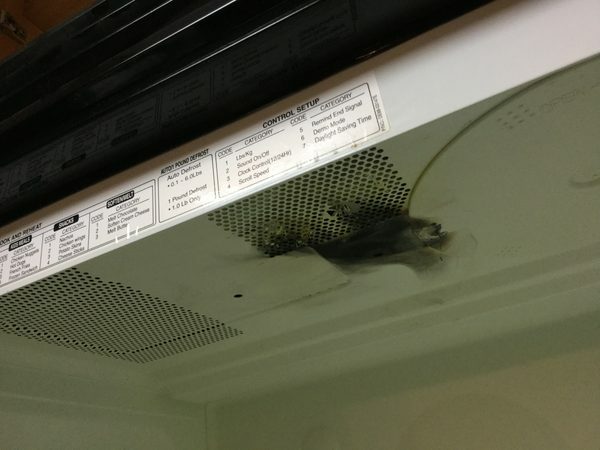 Has anyone pursued legal action with regard to your Microwave damage? I recently purchased this cover and watched and heard my microwave fry while we were using it. Wondering if any attorney has started a class action suit. This $15 item is now costing me over $3k for replacement. ( We have a combo built in wall oven and microwave and can’t just replace the microwave ). We are livid to say the least. I bought my Hover Cover at WalMart after hearing about it and thinking what an ingenious idea. Pet peeve are those covers perpetually sitting in the way on the turntable when you don't need them so much of the time! Anyway, after reading all these reviews I am terribly concerned about damaging or destroying my microwave oven! How can we know if the magnets aren't shortening the life of the magnetron or that arcing or melting won't occur, starting a fire?! The packaging only states that the magnets are encased in a polymer, not that they are ceramic or anything else! From the underside, they look like metal. I generally do not cook things in there for long periods of time so the 10 min guideline is not a worry. Defrosting and potatoes would be the lengthiest, perhaps. And people have not described having let it run a long time for the oven disasters to occur! Also, people are stating that it is BPA free but nowhere on the package does it say that! These "made in China" items make me very skeptical! Not interested in bathing my food in vapors form harmful chemicals in the plastic! Not sure where one can get a totally reliable and honest answer to these questions. Maybe calling my microwave manufacturer. I’ve used the Hover Cover for well over a month now and it works for me. I generally use my “Reheat” settings, which cycle the power on and off for longer periods of time, when warming previously cooked food. When preparing fresh dishes that require full power for an extended period of time, I remove the Hover Cover and use a glass cover for the food. Hope that helps. 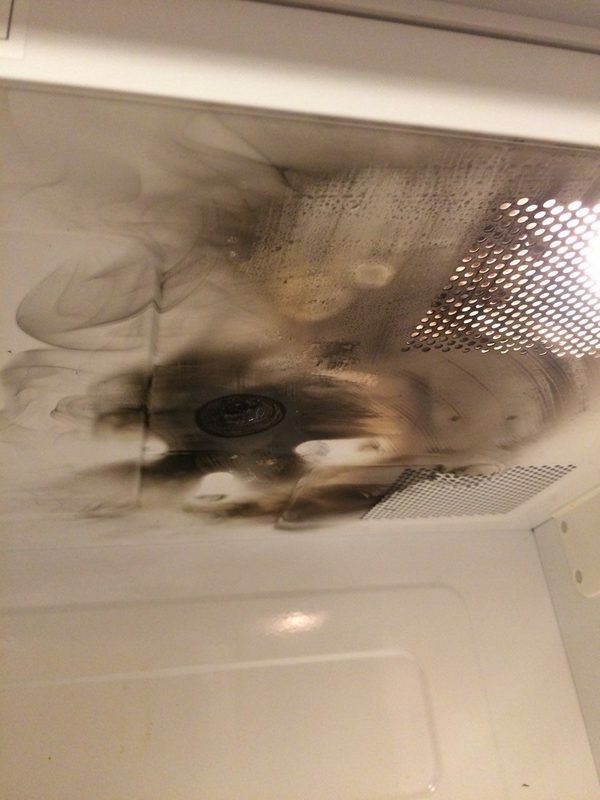 Caught fire in microwave and ruined my microwave have to buy a new one now terrible product and dangerous. I received my Hover Cover about a week ago. After a couple of uses, the cover sparked while in use in the microwave. Upon opening the door, there was an odor of burned plastic. Upon closer examination, I found a melted hole where the magnet attaches to the plastic. I immediately threw it in the trash. A total waste of my money. Also, the magnet is too weak! It kept falling down. Don’t buy these. They can start a fire in your microwave. Only used a few times before plastic melted and magnets shorted out microwave and started a fire. Luckily nobody was hurt. Magnets melted down in my microwave. Neet idea, but had poor / weak magnets that barely held it up. Only used a couple of times and the magnets caught on fire! Others who have experienced the "meltdown" please go to cpsc website and report as defective / dangerous to get these fire and dangerous smoke producers recalled. Purchased these thinking what a neat idea. Oh ya. After the first use the plastic around the magnet which by the way turned out to be a tin foil like strip covered by plastic. Anyway it caved in. One more time, the microwave starts popping and flashing. Luckily I was right there. When I opened the door the top of the Hover Cover was melted. And the tin foilish magnetic strips were done. Brand new microwave. The smell was horrible. Immediately contacted the company. No response / gave the pics to bbb. This is the dumbest idea yet. My microwave has a food cover already why would I pay $20 for something I already own. Duh! Just as as Susan from CO, I wondered about the magnets as well. Bought one anyway and liked it. However after using it for a few weeks, my microwave stopped heating! Just as I felt it may happen, the magnetron went bad. My GE Microwave was only 4 yrs old and got minimal use per day! The Hover Cover I bought just caught on fire and dripped into my soup along with the top of my microwave. Now to fight for help. The same thing happened to me. I made a tuna casserole and the Hover Cover cover melted into it. I was shocked. Should I be afraid to eat the casserole if I took the Hover Cover plastic out of the casserole or should I just toss it in the trash? Wondering if the plastic is poison. Super dangerous product. My magnets melted down / caught on fire! Why is this still on the Market. Are we protecting the chinese and their inferior products, on this one? On the 3rd use, there was a big spark in my microwave and upon opening I smelled burning plastic. On closer inspection, I found that a hole had been melted where the magnet is attached to the plastic. I threw it away! Very dangerous product! My offer was two for the price of one. A better use of your money would be to take $20.00 and drop it in any running body of water. This is a total waste of money. The premise is that you lift up the cover and let the magnets on top adhere your cover to the roof of your microwave and then let it down to cook your food. Once done, lift again and put it back in storage mode at the roof of your oven. The magnets are so weak, they don't even slightly hold the cover in position to the roof of your microwave. This is a total scam. DOES NOT WORK as ADVERSTISED! Ordered 2 of these, one for me and one for a friend. Neither would stick to the roof of our microwaves! Which was the main reason I ordered these overpriced covers. If you want to return them, YOU have to pay the return shipping and they don't refund the postage and handling you paid. Since the item does not do what the advertising stated, they should refund all costs paid and reimburse the return shipping costs or at least say they don't stick to many microwaves. Clearly the sales pitch lured me in and the product does not work as advertised. Mine won't stick to the top of the microwave. What can I do? Mine did not stick to the top of my microwave either. The magnets are too weak. Additionally, after just a few uses, the cover sparked while in use and melted a hole in the plastic where the magnet is attached to the plastic. I threw it in the trash. The cover is so awesome, don't know why others gave bad reviews, but it works like a dream for me. No more plastic wrap or paper plates to cover the food. Stores awesomely inside microwave to. Wish I would've bought it a long time ago. Received the Hoover Cover. Ir does not work, I am returning it immediately. I'm very upset Haband handles this piece of garbage. Hover Cover while it sounds great it does not tell you that this cover is only meant for large or full size microwave ovens, I wish the packaging tells people this before purchase, I can't return it because I tried to fix the size my self, because at full size it keeps the wheel inside my oven from turning and it a lso gets really hot to the touch. Scam-scam TV must know this is not right-----so whats up I will contact bbb ----------------------. I payed for 2 covers have not got yet ---------------do not buy-------------scam---scam-scam. Why won't my brand new Hover Cover stick to the roof of my microwave? Terribly disappointed and returning it immediately to the store. It doesn't stick to the top microwave only reason I bought it. Although I have not used the Hover Cover yet, it does not stick to the top of my microwave. What's the problem? The magnets are too weak! Horrible product. I ordered this months ago and never received it. I Googled what would happen if I put magnets in the microwave and the results said that the magnets quickly lose their magnetism. So, the claim that you can just stick this to the roof of your microwave to store it more easily is plain malarkey. Don't waste your money on these when you can buy better quality products from other outlets for better pricing. Don't say I didn't warn you! And, if in case you don't believe what I've written here, just google, "what happens if I put magnets in my microwave? ", and then read the results. You'll see exactly what I did. Most magnets are made of other materials than Hover Cover. They specifically state they use plastic magnets. So the search question you typed is not correct. You need to ask what are plastic magnets? And How do plastic magnets work in a microwave? Your oversimplified questions lead people down the road of wrong answers. You sound intelligent in your blurb so I assume its just an oversight. Thanks for the chance to help you out. The very weak magnets they used on mine appeared to be metal and encased in black plastic. Doesn't really matter now, they apparently arced / melted down taking the plastic with it. 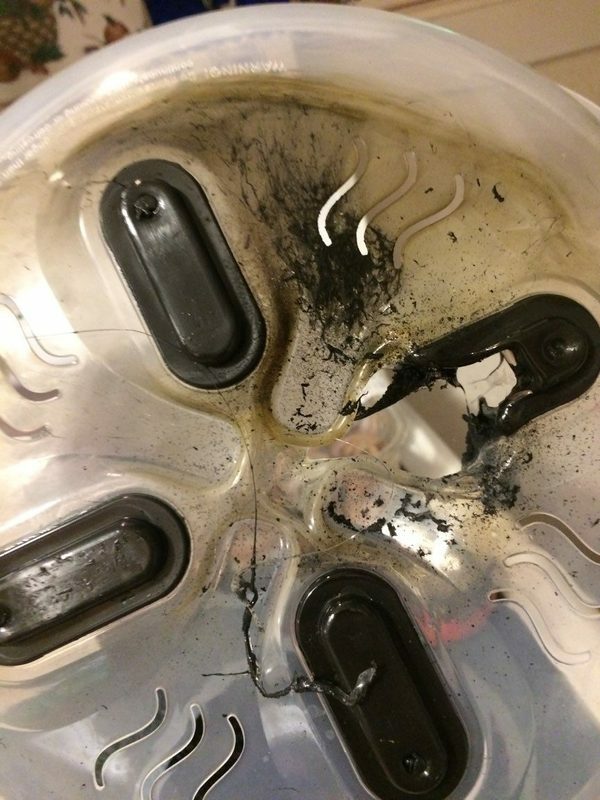 Fire & health hazard from melting plastic! Junk Junk Junk. Yes, the average person would need to ask what plastic magnets are. Laughing at you, what are they? They were a big thing in the early 2000's but have many limitations and their promise hasn't panned out yet. But the product says polymer-encased magnets, not plastic magnets, so who is asking the wrong question? Why not actually explain instead of writing something arrogant and mean that shows you don't know what you are reading? Sloopy asks the right questions and sure seems intelligent. What a waste of money. What you see on TV is not whst you receive. They are clear on TV and solid brown is what you get. But they don't stick to the top of the microwave. Don't waste your money. Never even received, should have read comments before paying. Went on Amazon typed in Hover Cover and found them from original maker, I bought for $2.99 and $4.00 shipping from factory in china. How can there be magnets in the microwave? Don't they mess up the motor and other parts? And think there are metal bits in them to? So how can it work without harming the inside? Both when warming the food and other area where all the electrical stuff is. I used my hoover cover 3 times and my mircowave quite working. I had to buy a new one I never thought about the magnets harming it. They need to put a warning on the box. That is about how many times I used mine. On the last time, there was a spark inside the microwave and that bad burning plastic odor. I discovered a hole had melted in the plastic where the magnet is attached to the plastic. In the trash it went! I ordered this plate cover with magnets, but when I received it there were no magnets AND there was only one although I ordered and paid for two. AND the quality was about the same as you get from a dollar store! Will have to try and return it, think they will reimburse me? It s probably poison and if I ate the casserole that the Hover Cover melted into I could expect cancer to come my way. Does NOT stick. My sister bought four of them, one for each of us, and none of them stick in anyone's microwaves. Don't waste your money, and it was pretty expensive. I don't like that I have to order the second one for an additional fee of $4.99 plus $5.00 if I want to upgrade. I only want one but I don't have that option. That stinks! So I will not be ordering. The commercial claims that the second is free. I guess not. I am just glad to view the reviews which I always do. The cover will not adhere to the top of my microwave. Is there something I have to do to make it work, otherwise it's yours again. Consider yourself lucky. If it doesn't stick to the top of your microware, then it might not have your magnetron, melt it down like mine. Weak Magnets and a fire hazard for sure. The Hover Cover is great however I was to receive a rebate for shipping for waiting so long, called the number and was told I have to join some saver club for $15 a month to get it. That's just plain dishonest. Where is the Hover Cover made?